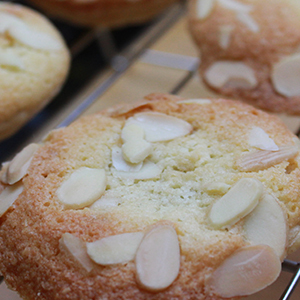 Heres a fantastic recipe by our Preserves tutor Vivien Lloyd for frangipane topped mince pies. These are a real winner and are something our guests love to take away with them on our Edible Gifts day. Please give them a try. In a large bowl, make the pastry by rubbing in the butter and mixing in the water with a small knife. Bring the pastry together with damp hands. Using a 7cm pastry cutter, stamp out 18 bases of pies and put into a pie tin. Put 1teaspoon of mincemeat into each of the bases. To make the frangipane beat the butter until very soft using an electric hand whisk, then gradually add the sugar and ground almonds. Add the flour, followed by the egg, then the rum. Spoon a generous teaspoon of the frangipane on top of the mincemeat. Sprinkle the surface of each pie with flaked almonds.